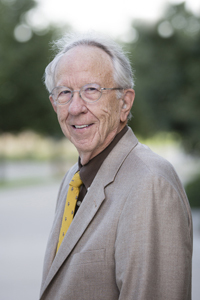 Baylor>Department of Religion>Our Faculty>Faculty>Ralph C. Wood, Ph.D.
Ralph C. Wood has served as University Professor of Theology and Literature at Baylor since 1998. He holds the B.A. and M.A. from East Texas State College (now Texas A&M University-Commerce) as well as the A.M. and Ph.D. from the University of Chicago. From 1971-1997 he taught at Wake Forest University in Winston-Salem, North Carolina, where he was the John Allen Easley Professor of Religion from 1990. At Baylor, his main appointment is in Religion, but he is also a visiting faculty member in the Great Texts program. He serves as an editorial board member for both the Flannery O’Connor Review and Seven: An Anglo-American Literary Review. He has also taught at Providence College in Rhode Island, at Samford University in Birmingham, and at Regent College in Vancouver. "I seek to interpret several of the major literary texts of the West, especially of the 19th and 20th centuries, from a confessionally Christian angle of vision. My aim is to show the relevance of these books to the witness of the Church as well as to the life of secular culture." Russell Kirk Paideia Prize for lifetime achievement in cultivating wisdom and virtue, awarded by CIRCE (Center for Independent Research on Classical Education), 2018. Seventh occupant of the Reverend Robert J. Randall Distinguished Chair of Christian Culture, Providence College, Providence, Rhode Island, 2010-2011. Winner of the Lionel Basney Award for the Outstanding Essay published in Christianity and Literature for 2011: “Flannery O’Connor, Benedict XVI, and the Divine Eros,” Christianity and Literature, 60, 1 (Autumn 2010): 35-66. Associated Church Press 2010 Award of Excellence for Best Critical Review. “Russia’s Gospel Writer,” a review-essay on Predrag Cicovacki’s Dostoevsky and the Affirmation of Life and Rowan Williams’ Dostoevsky: Language, Faith, and Fiction, Touchstone 22, 6 (July-August, 2009): 28-33. Mary Ann Remick Senior Visiting Fellowship, University of Notre Dame, 2007-2008. Editorial Board member for VII: An Anglo-American Literary Review (devoted to the work of George MacDonald, G. K. Chesterton, C. S. Lewis, J. R. R. Tolkien, Charles Williams, Dorothy Sayers and Owen Barfield. 2007-present. Distinguished Alumnus of Texas A & M University-Commerce, October 2002. One of 12 scholars invited to join the American Literature and Religion Project sponsored by the Pew Charitable Trusts and the Erasmus Institute of Notre Dame, 2001-2005. Jon Reinhardt Award for Distinguished Teaching among Senior Faculty, Wake Forest University, 1991. Manuscript Reviewer, Christianity and Literature, 1989-present. Editor-at-Large, The Christian Century, 1988-present. Book Review Editor, Perspectives in Religious Studies, 1988-2003. Editorial Advisory Board, The Flannery O'Connor Review, 1982-present. Chief author of a successful proposal to the Henry Luce Foundation for a three year, $75,000 program entitled "Religion and the Social Crisis," 1981 84. National Endowment for the Humanities Fellowship for College Teachers, 1982-83. Topic: "The Comedy of Redemption: Literary Vision and Theological Doctrine in Six Modern Writers." R. J. Reynolds Research Leaves, Wake Forest University, for study at the Istituto Lorenzo de' Medici, Florence, Italy, (1977); and at King's College, University of London (1988). Reid-Doyle Junior Faculty Prize for Excellence in Undergraduate Teaching, Wake Forest University, 1979. Manuscript Referee for Princeton, Pennsylvania State, Illinois, Missouri, Notre Dame, Yale and Oxford university presses as well as for Bloomsbury, Eerdmans, Abingdon, and Rowman & Littlefield commercial publishers. Tolkien among the Moderns, Ralph C. Wood, ed. (Notre Dame, IN: University of Notre Dame, 2015). Chesterton: The Nightmare Goodness of God (Waco, Texas: Baylor University Press, 2011). Preaching and Professing: Sermons by a Teacher Seeking to Profess the Gospel (Grand Rapids, MI: Eerdmans, 2009). Literature and Theology [Horizons in Theology Series] (Nashville, TN: Abingdon, 2008). Flannery O'Connor and the Christ-Haunted South (Grand Rapids, MI: Wm. B. Eerdmans, 2004). Issued in paperback 2005. Contending for the Faith: Essays in the Church's Engagement with Culture. Waco, Texas: Baylor University Press, 2003. The Gospel According to Tolkien: Visions of the Kingdom in Middle-earth. Louisville, Kentucky: Westminster John Knox Press, 2003. The Comedy of Redemption: Christian Faith and Comic Vision in Four American Novelists (Flannery O'Connor, Walker Percy, John Updike and Peter De Vries). Notre Dame, Indiana: University of Notre Dame Press, 1988. Still in print. “Flannery O’Connor’s Augustinian Politics,” Interpretation: A Journal of Political Philosophy 44, 2 (Winter 2018): 277-93. “Sacramental Suffering: The Friendship of Flannery O’Connor and Elizabeth Hester,” in A Political Companion to Flannery O’Connor, ed. Henry B. Edmonson III (Lexington, KY: University Press of Kentucky, 2017): 145-75. “Søren Kierkegaard, Walker Percy’s Love in the Ruins, and Transparency Before God,” in Kierkegaard and Christian Faith, ed. Paul Martens and C. Stephen Evans (Waco, TX: Baylor University Press, 2016): 95-116. “Why tolerance and voluntaryism are bad ideas: Stanley Hauerwas’s summons to Baptists and other ‘enlightened, Christians,” Review and Expositor 112 (2015): 71–80. “Undeceiving the Deceiver: The Demonic in Flannery O’Connor’s The Violent Bear It Away,” in Finding a Common Thread: Understanding Great Texts from Homer to Flannery O’Connor, ed. Robert C. Roberts, Scott Moore, and Donald D. Schmeltekopf (South Bend, IN: St. Augustine’s Press, 2013): 305-22. "The Lady with the Torn Hair Who Looks on Gladiators in Grapple: G. K. Chesterton's Marian Poems," Christianity and Literature 62, 1 (Autumn 2012): 29-55. "Confronting the World's Weirdness: J. R. R. Tolkien's The Children of Húrin," in The Ring and the Cross: Christianity and The Lord of the Rings, ed. Paul E. Kerry (Madison, NJ: Fairleigh Dickinson University Press; Plymouth, UK: Rowman and Littlefield, 2011): 145-51. "J. R. R. Tolkien: His Sorrowful Vision of Joy," in C. S. Lewis and his Friends, ed. David Hein and Edward Henderson (London: SPCK, 2011): 116-34. “How the Church Became Invisible: A Christian Reading of American Literary Tradition” (with Stanley Hauerwas), in Invisible Conversations: Religion in the Literature of America, ed. Roger Lundin (Waco, TX: Baylor University Press, 2009): 159-86, 210-16. “Climbing into the Starry Field and Shouting Hallelujah: O’Connor’s Vision of the World to Come,” in Flannery O’Connor, ed. and intro. Harold Bloom (New York : Bloom’s Literary Criticism, 2009). “The Perennial Appeal of Christian Humanism: The Case of G. K. Chesterton,” in For Faith and Friendship, eds. Fisher Humphreys, T. J. Mashburn, and Richard F. Wilson (Covington, LA: Insight, 2010): 119-42. “‘God May Strike You Thisaway’: Flannery O’Connor and Simone Weil on Affliction and Joy,” in Flannery O’Connor in the Age of Terrorism: Essays on Violence and Grace, eds. Avis Hewitt and Robert Donahoo (Knoxville, TN: University of Tennessee Press, 2010): 41-58. "How the Church Became Invisible: A Christian Reading of American Literary Tradition," (with Stanley Hauerwas) Religion and Literature 38, 1 (Spring 2006): 61-93. "Conflict and Convergence on Fundamental Matters in C.S. Lewis and J.R.R. Tolkien," Renascence LV, 4, Summer 2003): 315-338. "Lest the World's Amnesia Be Complete: A Reading of Walter Miller's A Canticle for Leibowitz," Religion and Literature 33, 1 (Spring 2001): 23-41. "Dostoevsky on Evil as a Perversion of Personhood: A Reading of Ivan Karamazov and the Grand Inquisitor," Perspectives in Religious Studies 26, 3 (Fall 1999): 331-48. “Rabbit Angstrom: John Updike’s Ambiguous Pilgrim,” in Rabbit Tales: Poetry and Politics in John Updike’s Rabbit Novels, ed. Lawrence R. Broer (Tuscaloosa and London: University of Alabama, 1998): 129-49. "Rapidly Rises the Morning Tide: An Essay on P. D. James' The Children of Men," Theology Today, 51, 2 (July 1994): 277-88. “Words Under the Rocks” [an essay on the film version of Norman Maclean’s A River Runs Through It], Christian Century 110, 2 (January 20, 1993): 44-6. Winner of the Associated Church Press 1993 Award of Merit for Critical Reviews. “Christ on Parnassus: P. T. Forsyth Among the Liberals,” Journal of Literature and Theology, 2, 1 (March 1988): 83-95. “Talent Increased and Returned to God: The Spiritual Legacy of Flannery O’Connor’s Letters”, Anglican Theological Review, 102 (April 1980): 153 67.